The summer rains have brought a fine mist over the beautiful city of Hangzhou - and as a result, the city seems suspended in the clouds. It's a look that suits Hangzhou, for the city is a paradise, a kind of heaven on the land, and in the mist it becomes even more surreal, as if you might meet the gods of ancient China strolling at the edge of the lake. It's the West Lake that has made Hangzhou famous for centuries - an idyllic, wide stretch of calm water surrounded by pagoda-studded mountains folding into the distance, and criss-crossed with old bridges and pathways laid long ago, when poets and Emperors looked out on the still waters coated in waterlily and lotus. In many ways, not much has changed in this ancient capital of silk and tea - a city that was at one time the capital of the entire country. The scenery remains untouched, and the flourishes that seem painted on by the delicate architects of old China have been preserved and respectfully resculpted. But in real terms, Hangzhou is an unexpectedly modern city, with conveniences that rival any of China's metropolitan Goliaths, and one which is perhaps alone in China for having achieved prosperous, modern development without sacrificing any aspect of its original charm. I'd arrived early in the morning with the entire day to browse Hangzhou's various quarters, and had expected to spend most of it on the West Lake, as I had when first visiting Hangzhou several years before. It was pure chance that took me in a different direction; or perhaps it is something in the nature of Hangzhou's people that makes them more likely to approach strangers with offers of assistance, for I was beckoned over several times during the day for no other reason than that. The first unexpected travel advice I received was from a neighbour on the K7 bus from the railway station (Hangzhou's station is vast and impressive, resembling something more of an airport) to the lakeside. She was an elderly lady clutching her shopping bags close as she leant towards me on her wobbly plastic seat, and I asked her which stop was the best to alight at and see the lake. I could get off at the end of Great West Lake Road (Xihu Dadao), she told me; but there I'd be surrounded by tourists and get a less compelling impression of the lake. She advised me to instead take the longer way around - a route which would make a full, broad circle of the city first, taking most of the day factoring in the various stop-offs - and that would end up at a far quieter side of the West Lake in the late afternoon. That way, she told me, I would get a chance to see something more of Hangzhou than most tourists get in the time I had. I decided to take her advice; I stayed on as the bus rushed past the crowds of holiday-makers cooing at the lilies and marble bridges at the more visited quarter of the West Lake, and switched to the route 27 once I passed the Shangri-la hotel - which took me deep into Hangzhou's tea-stained history. Longjing is the word on the lips of all people of culture who visit Hangzhou; it has the same ring as Champagne and Bordeaux, and is the name of the region that produces China's finest and most popular green tea. Longjing's tea received imperial approval when the Emperor Qianlong passed through on one of his long inspections of the realm - a true connoisseur of teas, Qianlong recognised the fine subtleties of the Longjing brew and stamped it as the 'Imperial tea', securing its reputation forever. 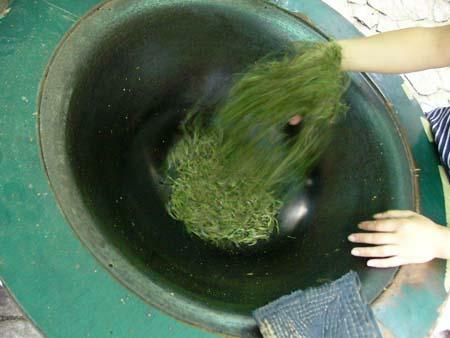 Longjing tea is enjoyed throughout the country and over the world at large, but it is in Hangzhou itself that the most authentic and choicest blends are available, right on the roadsides where the farmers themselves are stirring their favourite leaves over the roasters with their bare hands. Bus 27 terminates at Longjing – right at the east of Lion hill in Luohui Valley – and I watched through the window panes as it turned away from the lakeside and took upon the twisting route up into the mountains into Longjing's countryside. The scenery began to blush in deep green shades as we pushed into the lush forest. Longjing, which roughly translates as 'the well of the dragon', hides deep in the organic brush where the moist mountain air and organic soil keep the thirsty tea plants warm and wet, resulting in the flavoursome brew that won Qianlong's enthusiasm centuries ago. There in the midsts of the woods, straight rows of tea bushes stripe bare, secluded coves; farmers who pick the leaves more as a lifestyle choice than out of necessity wander happily about them, plucking the choicest leaves when they spot them, and collecting them in broad flax baskets. To describe Longjing Tea village as picturesque would be an understatement - there on the slopes of the mountain, Longjing's wealth has seen its village become just as pretty in its prosperity as it has been throughout the centuries. Now, modern townhouses and double-storied homes with elegant balconies receive tourists for calm afternoons spent over bottomless glasses of deep green tea, as visitors and locals pass each other on the pavement stones beneath, the clacking of their heels echoing off into the fields of tea climbing the mountainsides beyond, framing the village with pastoral grace. The immediate impression, as you enter the long, winding street towards the creek at the end of the village, is that this has to be the ideal place to retire. 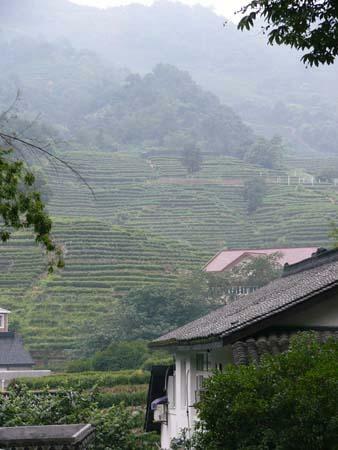 Without a trace of litter and with pristine fresh air, life in Longjing Tea Village appears to be idyllic and peaceful. Strong fragrances of freshly cut wood blended in the fresh air with the scent of tea, being roasted everywhere in large vats at the sidewalk. I asked a passer-by if rooms were for rent in the village, and was told that the average price is just a few hundred yuan per month for an unfurnished room, and about six hundred for fully furnished accommodation. It didn't take a lot to calculate that for a very modest rent, I could live the ultimate artist's life in a beautiful Longjing homestead, spending my days ruminating on the meaning of the universe over great, aromatic pots of Qianlong's favourite tea. I wanted to pick up a brick of tea as a gift, and had mentioned this to one of the friendly locals who passed a few moments wandering about with me. She told me the same thing I'd heard when in the city area - the tea sold to the tourists around the lake's edge is low-grade and makes for a poor brew. The merchants around the lakeside assume that tourists are unlikely to appreciate good tea, and so only the worst of the crop is bundled up and offered for sale at exorbitant prices to visitors - it's unlikely to be sold otherwise. 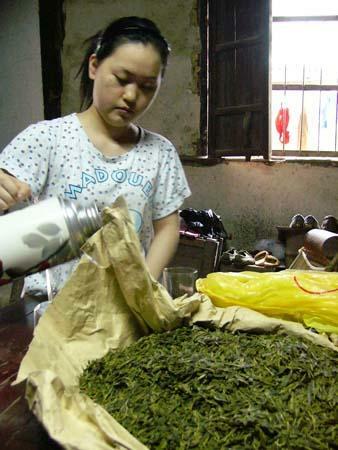 For seekers of the real taste, Longjing town is the place to go. But even there, flash tea houses have begun to push merely average leaves at passers-through, and it's uncertain that you'll find great Longjing brew even there. There is one well-known shop, however, that only sells the very choicest buds lovingly picked from the best tea bushes, and it is easy to find, being the only old-style home on Longjing Road. Amongst all the new mansions, the shop at number 216 Longjing Road resembles something of an old barn or farmhouse, which is essentially what it is. Walking inside, customers will see baskets and conical farmer's hats hanging from hooks; old photos on the back wall show the couple who farmed these fields many years ago and whose children have inherited the work in present times. I was greeted by a rosy-cheeked girl who welcomed me and sat me down at a great wooden table covered with tea equipment casually left aside; she shifted a space for me at the table and brought out a thick glass tumbler. From behind the table, she hoisted up a large package wrapped in paper and rope, which she carefully opened, revealing two separate parcels inside. Each parcel contained ready roasted, extremely fragrant heaps of tea leaves, intensely green and giving off rich, grassy scents. She stirred them proudly with her hands: both were exceptional grades, she told me, and I was welcome to try both of them. She carefully washed the glass with boiled water from a great thermos, and then added a pinch of tea to a separate vessel and flushed it with water - using the resulting tea to wash my glass again to prepare it to receive the best possible flavour. She then measured out a small palmful of tea leaves into the glass and filled it with hot water: the water immediately billowed with a fresh green cloud that filtered through the liquid. The leaves twisted and danced about, and the steam from the glass immediately released its tart, woody fragrance, spilling out into the air. Both of the teas were as exceptional as promised; the first a deep, strong blend and the second relatively crisp and light. I chose the first, and the girl measured out a 400g packet for me for the regrettable but acceptable price of RMB200. I wandered out into the village again, wallet lightened but in an exceptional mood - it could have been the bucolic pastoral setting; but then again, it could have been the heady, stimulating, inebriating effect of a great cup of tea. great article, i'm going there next june and i'll go see that place with my chinese friend for sure!! It's pretty easy to find - there's only one road that runs through Longjing Culture Village and it's number 216, about halfway down. Great article. I will be visiting Hangzhou soon. Hope I can find this teashop you mentioned. Any other tip you can share so that I can find this place easily. Thanks. Great article, I'll definitely check this place out when I get to Hangzhou!